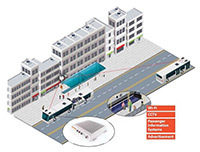 GoNet Systems provides carrier-class, outdoor Wi-Fi solutions to cellular operators and wireless service providers for 3G data offload and Wi-Fi access applications. We deliver a solid business case for 3G offload deployments through superior performance in terms of coverage, capacity & noise. 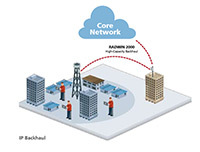 3G Offload to Wi-Fi solutions are gaining acceptance as an effective response to the rapid growth in data consumption. However, traditional Wi-Fi solutions, based on the standard indoor Wi-Fi technology fail to perform in noisy outdoor conditions. 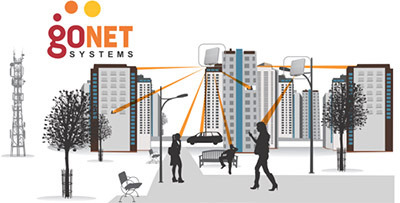 For this reason, GoNet Systems has created a new breed of Wi-Fi technology optimized to work in the harsh conditions of outdoor, urban environments. 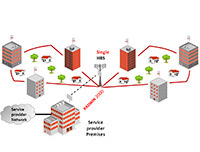 The solution has been specifically optimized to work in conjunction with 3G networks. Business Connectivity- Business users require a communication solution that answers the bandwidth demands of multiple users within the organization using a wide variety of voice, data and multimedia applications simultaneously. Residential service- There is a growing demand for wireless connectivity in the home in order to provider Internet access to multiple family members simultaneously, share files or printers, benefit from video streaming, real-time gaming, voice and video telephony, and more. Rural service- Rural areas are typified by small groups of people dispersed over large geographical areas. These deployments require broadband coverage of remote sites making the range of the wireless equipment a critical cost factor.